Bee2gether Gift Certificates are an affordable fun gift for any happy occasion: a birthday, a graduation or for the Holidays. 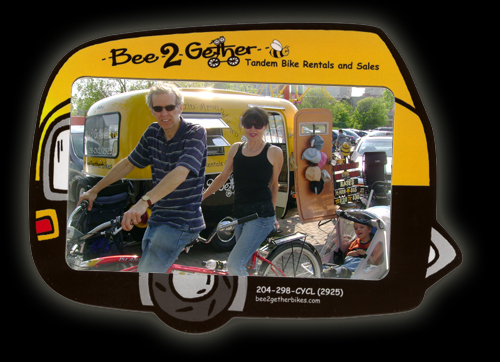 Your friends and family can use the gift certificate to rent a bike, purchase other Bee2gether memorabilia, and/or towards the purchase of a bicycle. 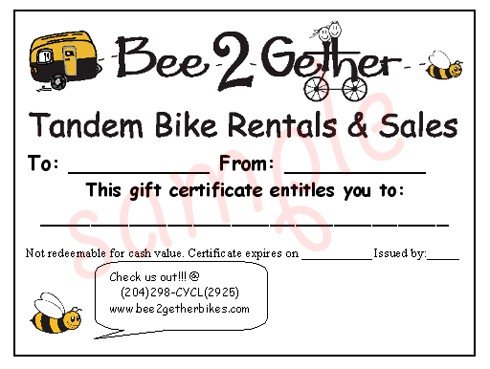 Bee2gether Gift certificates can be purchased in person at our Forks location during our regular business hours. All gift certificates come in a custom made pillowcase gift bag and are not redeemable for cash value. Gift certificates can be ordered in any denominations and can be sent directly to the recipients. Riding our bikes is an experience that customers never want to forget!  Get your picture taken before your trip and it will be printed and placed in our custom made fride magnets and presented in a gift bag upon your return. Magnets and pictures can be purchased for $5.00.